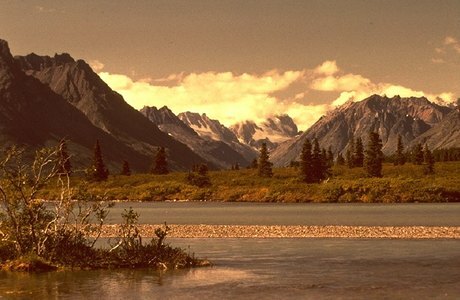 Lake Clark National Park and Preserve is a composite of ecosystems representative of many regions of Alaska. The spectacular scenery stretches from the shores of Cook Inlet, across the Chigmit Mountains, to the tundra covered hills of the western interior. The Chigmits, where the Alaska and Aleutian Ranges meet, are an awesome, jagged array of mountains and glaciers which include two active volcanoes, Mt. Redoubt and Mt. Iliamna. Lake Clark, 40 miles long, and many other lakes and rivers within the park are critical salmon habitat to the Bristol Bay salmon fishery, one of the largest sockeye salmon fishing grounds in the world. Numerous lake and river systems in the park and preserve offer excellent fishing and wildlife viewing.